Originating from a suburb northwest of Chicago, Lost In Blue have released three demos in their short time together. As with the previous two, Remain in this Dream is comprised wholly of instrumental metal. It's true, nary a voice to be heard among the four tracks of this MCD. The absence of voice marks Lost In Blue's greatest obstacle, though the four musicians offer fine compensation through their well-executed instrumentation. As an example, "V-Show Song" kicks off Remain in this Dream with outstanding guitar solos and leads that express a varied range of emotion, from sorrow to hope. Carrying the song from one emotion to the next, the intricate bass lines of Ryan and the skillfull drumwork of Zach dance just below the guitars in a truly mesmerizing display of talent. The band members make it a point to offer a variegated blend of influences in their music, to which they do a fine job. While progressive influences are conspicuous on the first two tracks, I find these two to be the most metallic on Remain in this Dream. "Lonely Blue" definitely has the biggest bite, with Maiden-inspired soloing and a traditionally styled theme riff. Insert a Matt Barlow or even a Rob Halford here and this track becomes unforgettable. The remaining two tracks offer a contrast to the two mentioned above, introducing a more progressive (and introspective) side of the band. The guitars continue to do the talking, with both Adam and Keith offering up quite an emotional display of fretwork. Perhaps delving a little too deeply into the progressive cauldron, "Dead Moon Rises" spans a tedious ten minutes and at times feels as if it could have been separated into two tracks. Though the listener is exposed to some very interesting passages, the sum of the parts makes for a tough journey. 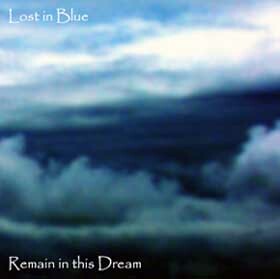 The song does, however, serve to concatenate Lost In Blue's many influences. This band can and does stand apart from the pack of up-and-coming metal outfits. Their musical talent is unquestionable as is their ability to mingle many styles together in an interesting, and thoughtful, mixture. However, I'm not particularly fond of instrumental metal and in this I am not alone. The band is tight, but to leap to the next level a quality singer is required. The band understands this, as they are currently seeking a talented individual to fill the position. Until then, Lost In Blue still deserves an inspection from those metal fans seeking something interesting and, more importantly, something good!